All of our dogs are from rescue and have been since 1994. 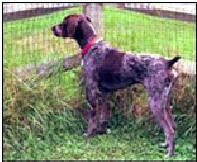 The first three dogs are German Shorthaired Pointers (GSPs); the fourth dog is a Boxer. Each dog’s past is a mystery but rest assured their future is certain. 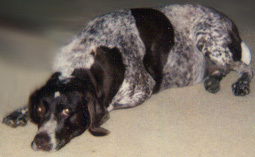 Liebchen (ticked with liver spots on the right) was our first adoption. Found wondering the streets in Tulsa, OK, she is enriching our lives beyond measure. With her AKC limited privileges she has earned her Canine Good Citizen (CGC) and Companion Dog (CD) level training. We have learned clickers, freestyle dance, and tracking. She’s our ringer who can do anything. Yeagger was found on the North Carolina coast strolling along the beach. Emaciated, dedicated volunteers transported him to GSP Rescue near Raleigh where he lived for several months while being nursed back to health.Now fully recovered, he is our wild man who keeps the deer at bay and the guineas on the roof. A joker at heart, he often teases the ladies by laying his treats in front of them then waiting for one of them to jump at it. Yes, he looses his treats quite often but he’ll never go hungry again and we think he knows that. Gretta came with the ranch. At the real estate closing the former owners told us that they couldn’t catch her and said they’d call Animal Control to come get her. My husband and I looked at each other then said that we’d keep her. When we first saw the ranch, she greeted us with a gentle wolf and a happy bounce. Forever cheerful, she continued greeting us after we moved in. Within four weeks, and with the help of several packages of liverwurst, she decided to let me catch her. She clearly made the choice because when I put the lead around her neck, she stood very still, making no attempt to leave. Now we can take her anywhere and she is a prefect lady. We lived in a rented house for a year before we started looking for a place. Liebchen, Genie, Yeagger, Bob and I would load up the van for the day and be gone all day. The dogs were great company; when we stopped for lunch we all got hamburgers but the dogs got only the bun and meat (hold the lettuce please). We’re glad we started this because is took us almost two years before we found a place that was perfect. Then we wanted a name for our new home. We kicked around several names but then Bob looked around the bedroom and noticed that all the dogs were sleeping. He said, “How about Sleeping Dog Ranch?” That name was perfect!!! Sleeping Dog Ranch it is.